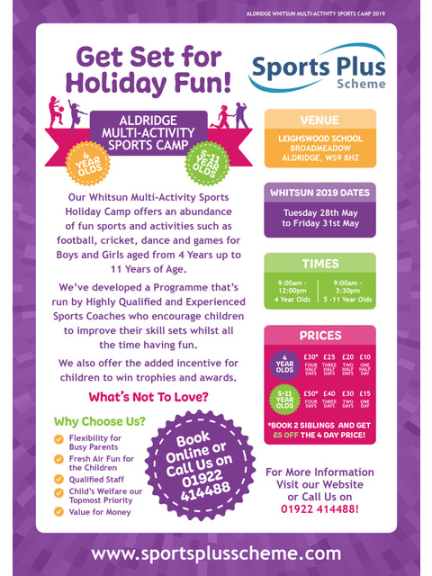 Sports Plus Scheme are hosting an exciting Multi-sports Camp at Leighswood School in Aldridge this holidays, where your children can get involved with a range of activities. Children will have the opportunity to participate in activities such as Football, Multi-Sports, Cricket, Dance and various games and activities. All games are designed to improve children's confidence within a sporting environment with an emphasis on FUN at all times. Sports Plus Scheme's camps are led by highly-qualified and experiences sports coaches who work within primary schools during term time to deliver Physical Education support. Join Sports Plus Scheme at Leighswood School, Broadmeadow, Aldridge, WS9 8HZ. To secure your booking, contact Sports Plus on 01922 414488 or 07715 092244.